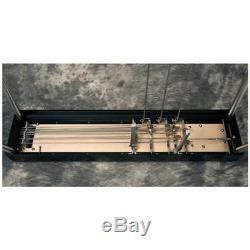 GFI Musical Instruments S-10 SM Pedal Steel Guitar with Hardshell Case (3 pedals, 2 knee levers). Have you ever heard that high, lonesome sound? 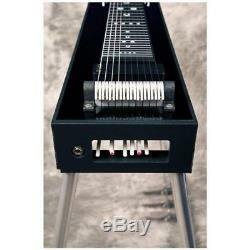 The S-10 is a single-neck, 10-string pedal steel. 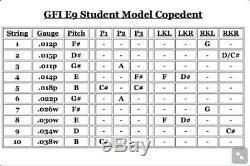 It's set up to accommodate E9th Nashville tuning, the tuning of choice for country, country-pop, and rock. 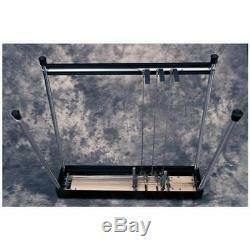 The 3 floor pedals and 2 knee levers are used to bend the pitch of selected strings or pairs of strings. The GFI S-10 uses a single finger pull-release system, to ensure that the pedals and knee levers work smoothly and efficiently. The body is laminate-covered hard-rock maple die board with a Mica finish. 3 pedals, 2 knee levers; Die Board Body with Mica Finish. 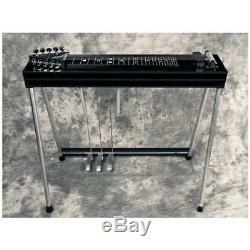 Aluminum Frame with Black Hammer Tone Coating. We stand by the products we sell, and we'll certainly stand by you as well! Sam Ash is not responsible for any damage caused by not adhering to the voltage requirements. We strongly suggest that you check your order after receiving it to be sure that it is in proper working order. Resalable Condition means that the product(s) is exactly in the same condition as you received it. Please call our Customer Service department if you have any questions about returning an item. 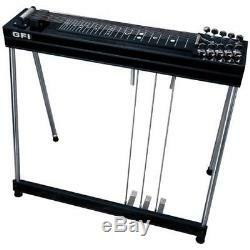 The item "GFI Musical Instruments S-10 SM Pedal Steel Guitar withCase 3 pedals 2 knee levers" is in sale since Thursday, December 13, 2018.